The white look was incredibly classy and very appropriate. The evening look with the spectacular earrings and the Fijian blue colour is a downright knockout. On white on she looks like a doll. The second choice is not so good, but the color may look stuffy because the light is poor. Much better. Finally an appropriate appereance! Her dresses for both occasions are on point. 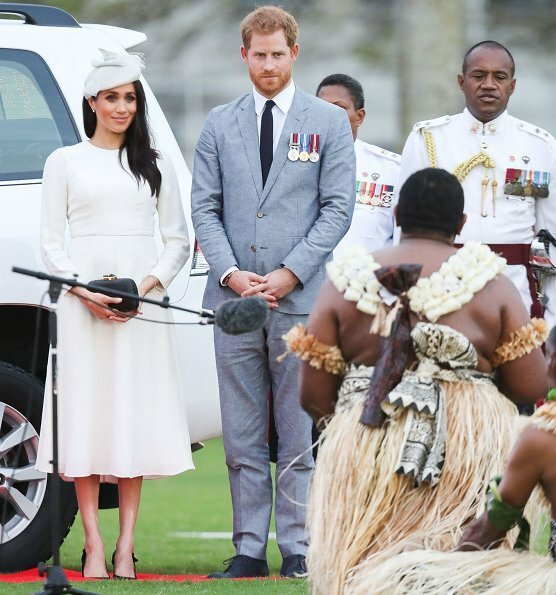 That Fijian Blue dress, is just wow. Very simple but elegant and classy at the same time. 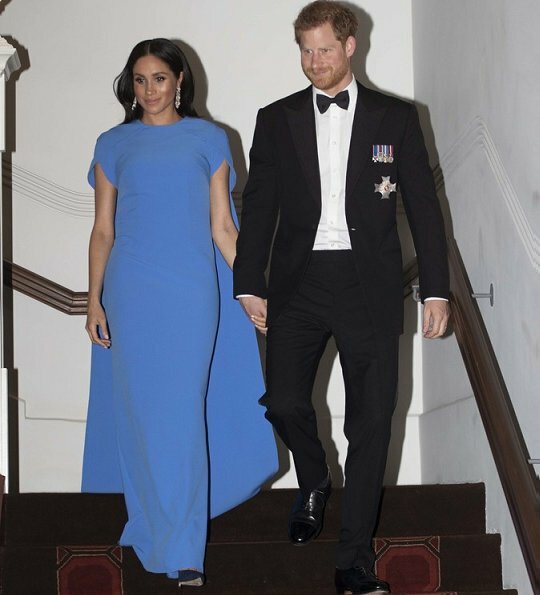 I like the blue dress better on Meghan than on the model. Well of course it may be, but on the other hand, she is quite short and slim, so her body won't hide anything. Every pregnancy is different, so let see. Instantly I have forgotten my criticism of her dress style! Both outfits are ‚tone at the top‘ a n d almost the style she has always preferred, only a little more distinguished. 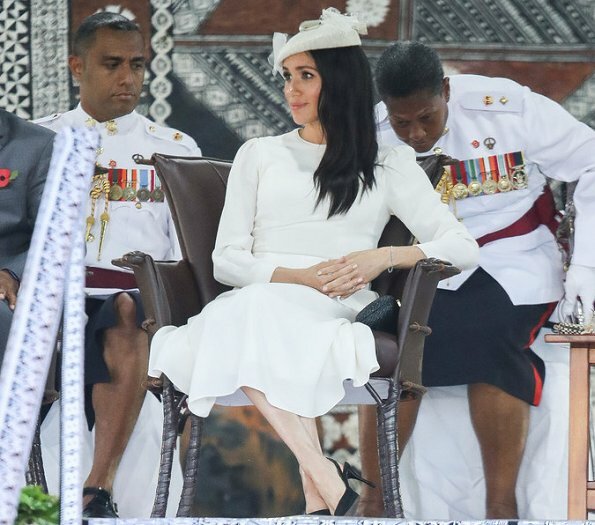 I think she has never looked more royal than this time. The white outfit is so classy and perfect choice. Although I like the blue dress too somehow it doesn't feel right. I feel like it's too much. But in the white outfit she is amazing. There is Hope, she heard your cries and she has delivered very gorgeous outfits and some color...yeah! Wow! That blue dress is amazing! prachtige blauwe kleur, zo blauw, blauw, mooi. Very ladylike for day, and stunning simplicity and elegance (and COLOR) for evening. Fabulous! 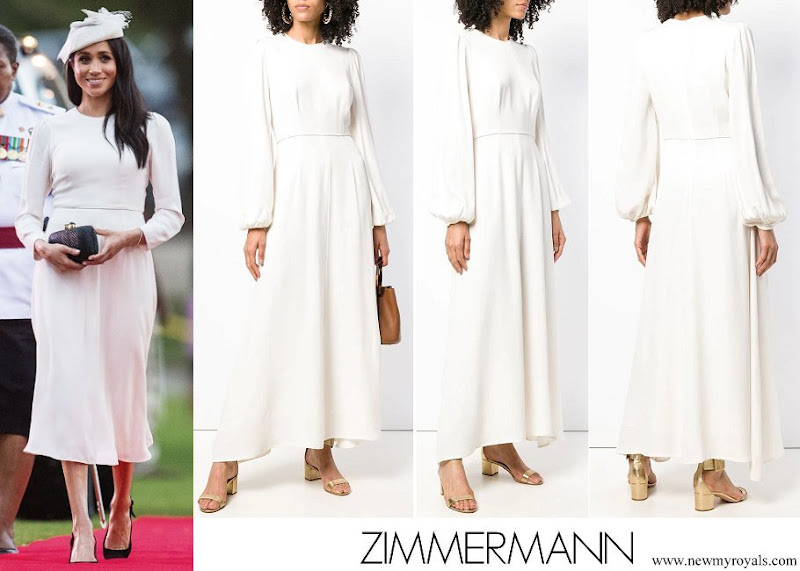 Love both outfits,Meghan will never be a Disney princess,she is a modern working royal lady.Pure lines and minimal styling. Very nice, great choices. The only thing i will change is the hair style for the blue dress. 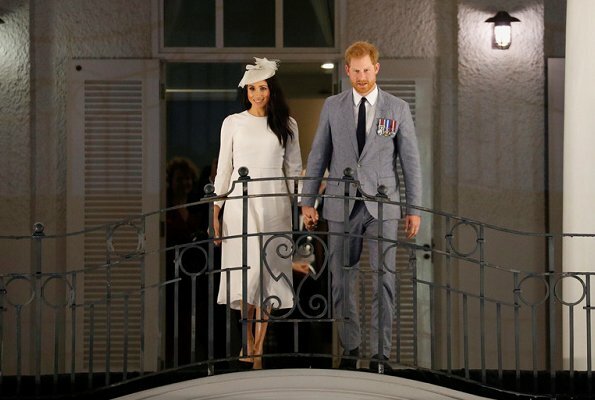 The white dress is really very nice and chic, she honors the country with the much effort of this style. The evening dress is ok. The colour (finally, colour!) is very nice, esp. in the first pic. The shape is not bad but could be better. The white dress looks lovely on her. I was not wowed by the blue one and I am not sure why. Maybe the color did not read well with the lighting. AHHH enfin de la couleur et une très jolie robe! Couldn't agree more. She will never be a Disney princess. 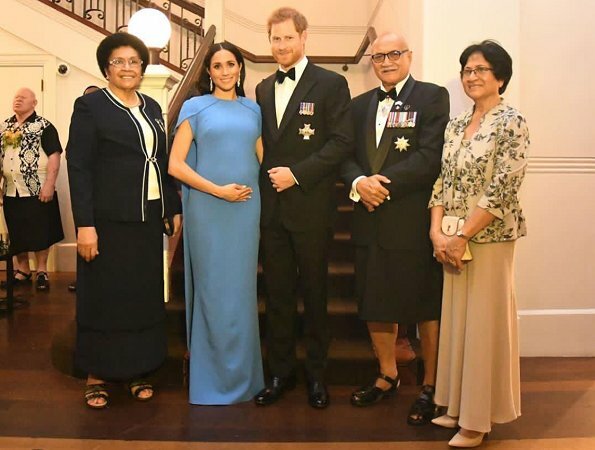 The colour on her evening gown is so saturated, it is almost hard to look at it - and it certainly makes sense given the Fijian flag, but I feel that it could have still be toned down a bit. Lovely (and unexpected) choice. The arrival outfit is nice, I am sure not many of us expected a hat, but to some extent too formal (perhaps intended to 'balance' the too casual outfit from the previous day). Nonetheless, she looked good, happy and a bit more rested. Megan's work ethic is impressive, I am certain her Majesty is very pleased that they have kept the schedule and are doing an splendid job at representing her. 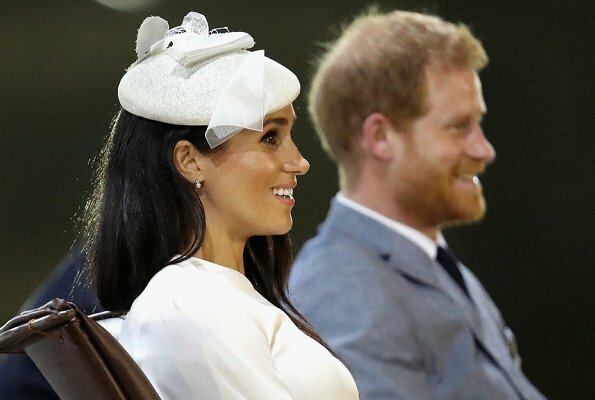 Meghan looks glorious! Her choices for each occasion are spot on. The blue Safiyaa is a real stunner. I like this white dress and hat maybe an updo would have been better. The blue dress screams wow. Very elegant. Her bump is showing pretty well now. Oh, Wow! Sneaked a look at the photos of Fiji while at work and they made my day. I have almost forgiven and forgotten all the depressing outfits we have had to date. Totally blown away by both these outfits. The people who don't understand why we have been crying out for colour and class, just look at these pictures and see the difference! 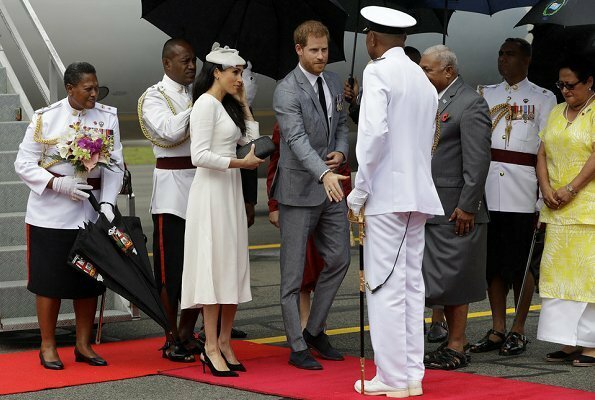 Wow, the Duchess can dress well when she has to. But her hair just hangs (as usual), she's got to have that hair to play with. 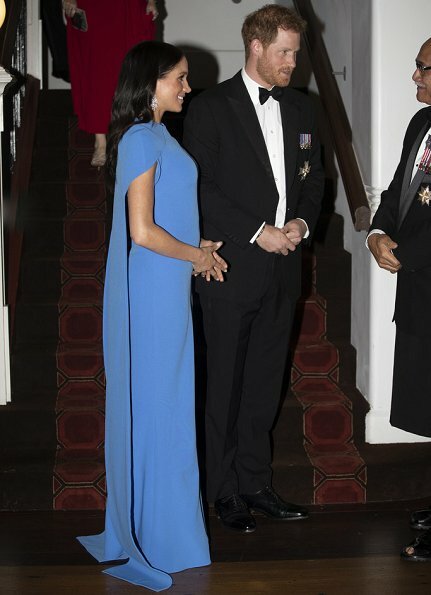 I love the blue dress; but I wonder why even with other royal ladies the style is for those panels to drag on the floor, surely that could be dangerous and unsanitary. Harry looks nice in his tuxedo. I imagine he changed back into his comfy old holey shoes when the festivities were over, just as Haakon would do with his. The evening gown has very elegant style, I love the sleek cape. I think it was a nice gesture to choose Fidzi-blue, but it's not my favorite. Love the blue dress! With a different hair style she would be really WOW!!! 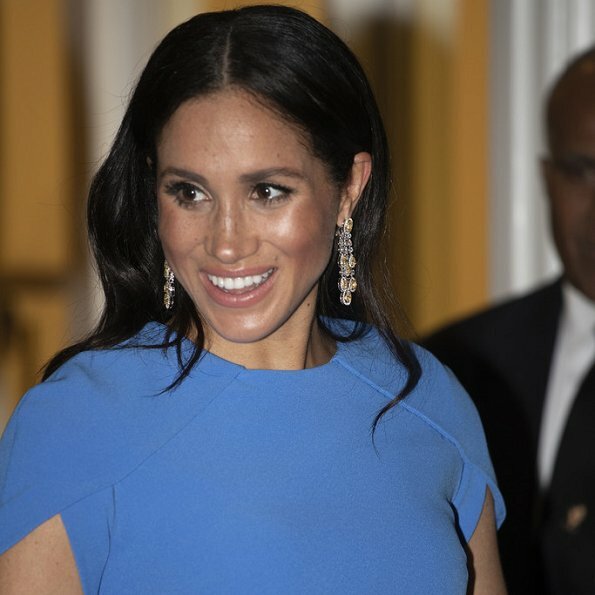 Meghan is a very beautiful pregnant women. 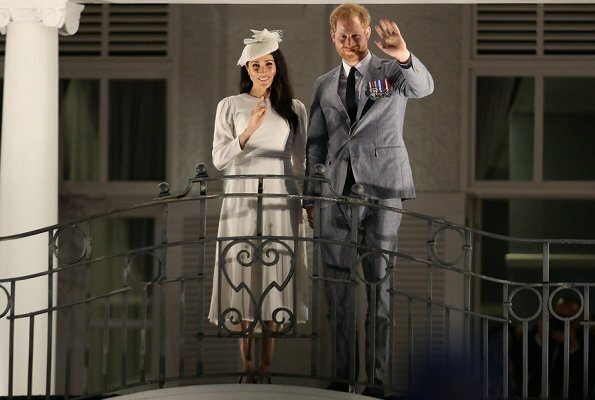 During the dinner Harry supported Meghan and toasted with water as well, how cute is this? 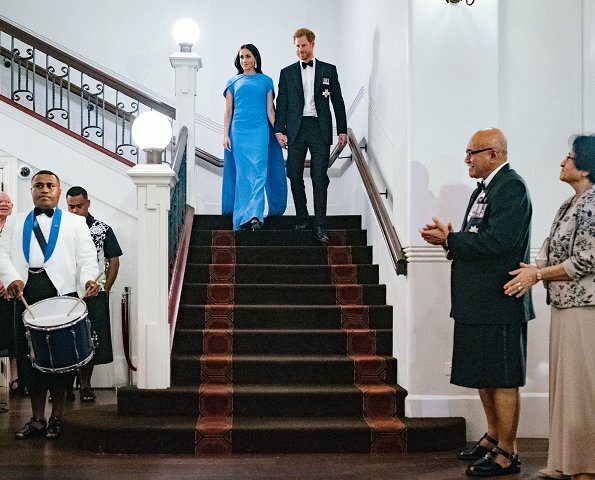 She rocks this look, love love love the blue dress and the nod to the Fijian flag is lovely. The earrings are beautiful and suit the long dress. That bump is growing in front of our eyes. The blue dress doesnt look good in my opinion. The white outfit is amaaaaazing. The evening dress is simply beautiful.